This isn't the first time the two reputable pollsters have presented wildly disparate findings. Though it's becoming standard with their results in the state of Ohio. 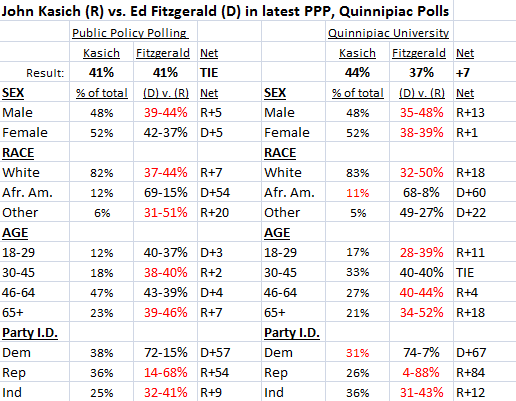 Back in August, I noted on this blog how recently released PPP and Quinnipiac University polls in Ohio diverged significantly. It was as though the polling firms had polled entirely different universes. In one (found by Quinnipiac), the Governor of Ohio was pretty darn popular, sporting a 54% job approval rating, versus just a 32% disapproval rating. Voters said, by a 49-37% margin, that Kasich deserved reelection. And he led his most likely Democratic opponent, Ed Fitzgerald, by fourteen points. President Obama was in terrible shape in the state as well, with a 40/57% approval rating. In the other (found by PPP), the Governor was struggling, managing just a 42/47% approval rating, and trailing his virtually unknown Democratic opponent by three points. President Obama was underwater (47/49%), but not nearly to the extent found by Quinnipiac. 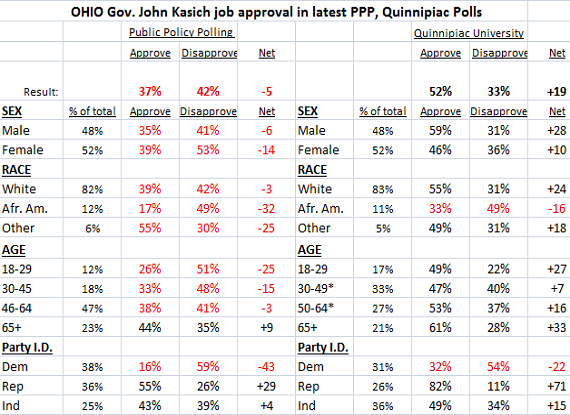 Noting the two most recent polls in the above table, you can see how once again, PPP and Quinnipiac paint very different pictures for the state of Ohio voter's opinion on their Governor and the 2014 race. According to the former, Kasich is unpopular (37/42% job approval), and running neck and neck with his most likely Democratic challenger. According to the latter, Kasich is quite popular (52/33% job approval), and enjoys a modest but discernible lead in a hypothetical 2014 match-up. So what difference does any of this make, anyway? Well, it makes a huge difference to the Kasich and Fitzgerald campaigns, for obvious reasons. But beyond that, it makes a difference to Quinnipiac University's Polling Institute, and Public Policy Polling. There's just no way to test their accuracy at this point, at least not until more pollsters weigh in on the state of things in Ohio. Both polling firms performed relatively well in the 2012 election, and have strong track records. Quinnipiac is nonpartisan. PPP is not, and has come under a fair amount of fire recently from poll-watchers for suspect methodological practices. Regardless, both sides have some numbers to point to to prop up their standing. "Take your pick," so to speak. And if that's what you intend to do, former TNR polling writer, and new New York Times employee, Nate Cohn offers his advice on which to pick.